A reception was held for Mayor David Cartmell in recognition of his 20 years of service to the citizens of the City of Maysvill on Dec. 18, 2018. More than 100 well-wishers attended the event at the Cox Building Ball Room to congratulate Mayor Cartmell for a job well done. The reception attracted folks from all over town and even from out of town. 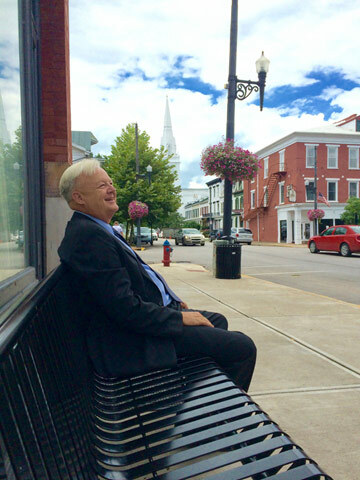 Judge-Executive Joe Pfeffer presented Mayor Cartmell with a Pioneer commission and remarked on how well the county and the city have been working together on projects to better the community. The City Commission, led by Mayor Pro Tem Victor McKay, presented the Mayor with a proclamation declaring Dec. 18, 2018 Mayor David Cartmell Day. The Mayor also received a photographic piece representing many of the capital improvement projects the City has been involved in completing in the 20 years of his tenure. The Mayor remarked, to laughter, that thrown biscuits at an old dog was no way to get rid of him.